If the last two weeks of mainstream press coverage are to be believed, the only relevant features in Apple’s new iPhone 4S are Siri, the phone’s remarkable digital assistant, and the new 8-megapixel camera, which delivers near point-and-shoot image quality to Apple’s mobile platform. But there’s one other feature that’s largely been ignored, even though it too was demoed at the iPhone 4S debut: Apple’s A5 processor, which grants exciting new opportunities for iOS game developers. 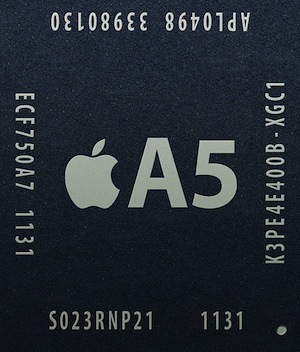 The 1GHz dual-core A5, along with various aspects of iOS 5, have the potential to seriously supercharge gaming on both the iPhone 4S and iPad 2 (which uses the chip too). At Apple’s iPhone 4S launch event, we were shown a demo of Infinity Blade II, and its graphics were impressive enough to wow even jaded console enthusiasts and PC gamers. In your curiosity duly piqued? Here are some of the virtual sword-clashing, adventure-questing and strategy-pondering improvements we can look forward to as game developers explore (and hopefully implement) Apple’s latest updates. Smartphones and tablets are great gaming platforms, but they have typically placed us in graphically simple visual environments (think Angry Birds or Scrabble). But now that Apple’s A5 processor is available in both iPad 2 and the iPhone 4S, game developers can go hog wild in designing graphically intense 3D worlds for iOS, confident of a growing installed base of Apple’s fastest mobile chip. According to Apple, its A5 processor delivers CPU performance twice as fast as its previous chip, along with seven times faster graphics processing — and all without additional battery life penalties. That “everything” includes high-end rendering techniques. At Apple’s iPhone event, Mike Capps of Epic Games said some of these techniques aren’t even used in top-line gaming consoles. For example, the A5 chip allows Infinity Blade II to include insanely detailed graphical flourishes, such as light rays shining through trees, character shadows cast on the game environment, koi swimming in a pond, and individual dandelions blowing in the wind. The increased processing power enables richer, more cinematic gaming experiences, bringing iOS gaming much closer to what you’ll find on consoles, if not gaming PCs. Indeed, now it would seem that touch-based game control, and not graphics firepower, is the primary hurdle preventing iOS devices from becoming ideal platforms for shooters and other action games. Mustard described how he was playing Infinity Blade II on an iPad 2. His character had just finished a fight, and picked up a sword that had fallen on the ground. Mustard then opened up Infinity Blade II on his iPhone 4S — and began playing the game exactly where he had just left off, his character with sword in hand. “Seamless syncing across devices is a huge thing for gaming,” Mustard says. The iCloud feature enables users to effortlessly transition a game-in-progress from one iOS 5 device to another, allowing for an uninterrupted gameplay narrative as they move from, say, their subway seat to their couch, or even from room to room. 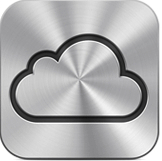 iCloud offers other unique benefits that game developers can begin coding for in updates and new titles. 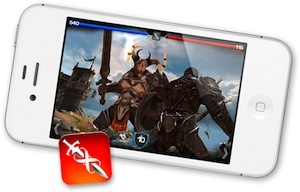 In Infinity Blade II, for example, users will find a new community-based gameplay mode called Clash Mobs. It works like this: You get a notification that a big monster is available to fight for the next 24 hours. The monster is loaded with 1 million hit points. You fight him, knocking off 10,000 of his hit points. The monster now has 990,000 hit points. Thousands (if not millions) of other gamers take their hacks at the same bad guy, and together you work in concert to take him down, unlocking weapons and other features. But that’s just one example of crowd-sourced gameplay. Other group-based challenges could be incorporated in a wide variety of games and game types. Just as the original iPhone’s accelerometer gave us the entirely new genre of physics-based gaming, we should expect developers to respond to iCloud with similar innovation in community-based gaming — leading to novel new modes of play we can’t yet imagine. Asynchronous turn-based gaming: It’s a fussy phrase that describes something quite simple. In effect, iOS 5 lets you play turn-based games against friends in a non-live, non-real-time environment. In iOS 4, both players had to have their apps running at the same time to, say, play a game of chess. But now, thanks to asynchronous turn-based gaming support, you can play all variety of turn-based games at a much more leisurely, convenient pace. After you play your turn, a push notification is automatically sent to your competitor — who can act immediately, or pick up the game when time allows. And via the iOS Game Center app, which was added in iOS 4, players can manage multiple games-in-progress to keep up with the action (or whatever passes for action in the asynchronous turn-based gaming paradigm). 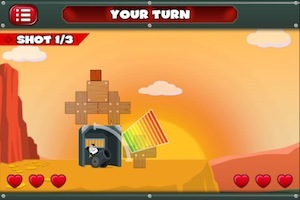 “The ability to play turn-based games asynchronously with your friend via Game Center in iOS 5 makes mobile social gaming even more convenient on mobile devices, which people tend to pick up and put down throughout the day,” says Tam, whose company developed a turn-based game called Cannon Ball, pictured here. And that means developers can spend more time creating rich, well-designed gaming experiences with more creative twists. iOS 5 makes it easier for you to discover new games in Apple’s Game Center by exposing the preferences of your trusted confidantes. Specifically, Game Center can now make recommendations based on what your friends (and non-friend competitors) are playing. iOS 5 users can also connect with friends of friends without knowing their email addresses or nicknames. Players can now also download games directly from Game Center if they see one of their friends is playing a game they don’t already have. Before, you had to exit Game Center and go find the game in the App Store. “This is a major benefit to developers because it makes it that much easier for people to get involved with a new game,” Tam said. Platform updates always pose a challenge to game developers: Should they start coding their games for the new hardware and software, confidant of an enthusiastic (and large) installed base? For that matter, should they go back and update previous versions of popular titles, if only to take advantage of a few new features? Easy: It’s a relative term. 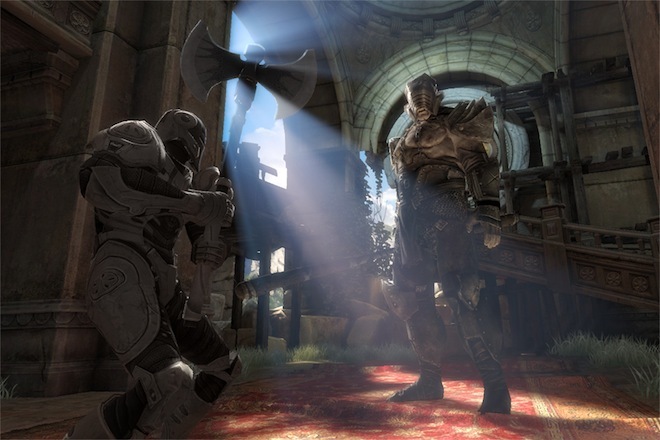 Nothing about the graphics of Infinity Blade II looks that “easy” to pull off. But one thing’s for sure: Apple’s latest hardware and software updates are great news for mobile gamers, and the pressure is on developers to innovate. What iOS games would you like to see updated with new features described above? Please tell us in the comments section of this article.